Alrightly, it’s the first day of the Cultural Festival and also Karasuma’s birthday. Tenma baked a cake [After practicing for a long time] specially for Karasuma and Yakumo offered to hold on to it till the surprise party. P.E teacher, Kouriyama-sensei patronized 2-C’s Café Rumble and was shocked to see the setting similar to a hostess club lol. He was even given a ‘menu’ with pictures of girls and asked to pick and choose lol. Anyways, Tenma didn’t get any customers and was feeling pretty depressed lol. But Akira, aka Mama/Mamasan encouraged her, giving her advices and told her not to give up lol. Meanwhile, the boys of 2-C were cooking behind the scenes and was interrupted when Suga rushed in and announced that their business had been taken away by the Tea Club’s café. Nara was sent to be the scout to check up on Tea Club’s café, but he never made it back as he was treated to a scene of Itoko-sensei in a maid costume LOL! Hanai’s grumbling about Nara’s lateness, volunteered to go and even said he might not make it back as Yakumo’s in the Tea Club. True to his words, as he opened the door, saw Yakumo in a police costume and began cosplaying as the Chief Inspector LOL! At the same time, Tenma’s popular with the kids acting as Dojibiron Pink lol DUWA! Harima was made to wash the dishes when he couldn’t pay for the ‘service’ and wondered when the Manga competition results were coming out and assumed he probably didn’t made it. Yakumo overheard it and probably wanted to help him up. [LoL, I love the part where Sara was cosplaying as a nun lol freaking hilarious] Itoko-sensei appeared behind Harima and told him that a ‘sensei’ waiting for him at the backroom. The ‘sensei’ turned out to be Yakumo and Harima suddenly realized that he’s in the Tokiha-sou aka the Holy Land of Manga [Tokiha-sou is an apartment where many manga authors who later became famous, lived.] So they got on to work and began engaging in conversation. Harima said that he hadn’t been drawing lately, when Yakumo asked why, he replied that something in him just burnt out. Harima asked Yakumo what motivated her to keep on drawing. Yakumo told Harima that she wants to see the children and the people around her happy and encouraged Harima not to give up and continue drawing. They were interrupted by Hanai’s shouting for Yakumo outside, it appeared that Yakumo’s wearing Hanai’s spectacles lol. Harima assured that he’s fine and told Yakumo to go to Hanai. A while later, Yakumo returned only to find Harima gone and Harima seemed to have regained his fighting spirit again. Harima got a call and was informed that he won the newcomer Manga competition award and Eri’s butler, Nakamura was accepting the award on his behalf at the ceremony lol. Harima was filled with joy as the day he would be recognized as a man and a manga artist had come and decided to share the happy news with Yakumo. The guys in 2-C were depressed as there’s no business for them and the girls were gone. Harima suggested that they take matters into their own hands and become hosts themselves lol but failed. The girls returned from shopping for a party to celebrate the success. Tenma went to pick up her cake from Yakumo and happened to see Yakumo making a cake for Harima and Tenma as usual mistook it for something else lol. Anyways Tenma took the two cakes to their class and placed her cake for Karasuma on a cart outside the classroom and entered the classroom with the cake for Harima. Harima tried to catch up with Tenma but tripped on the cart and toppled the cake. 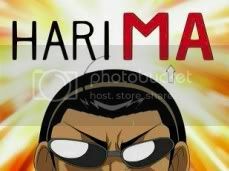 Harima presumed that the cake was for him as his name had the last two letters ‘MA’. [KarasuMA too lol] Harima then tried to fix it up. In class, everyone cheered for doing a good job in the cultural festival. Fuyuki began his announcement for a great news. Harima thought it’s about him but no, it’s Karasuma’s birthday! 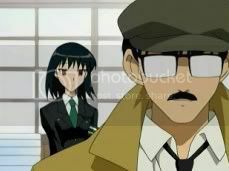 Harima then realized his mistake lol. To cover up his mistake, Harima pretended to trip and fall onto the cake but it turned out to be Yoshidayama’s swimsuit sumo championship cake LOL! Tenma then presented Harima the cake Yakumo made and congratulated him. 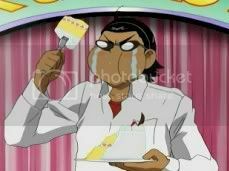 Harima then sat in a corner happily eating the cake he thought Tenma made for him. Harima even gave a little morsel to Yoshidayama to show how sorry he was lol. Tenma looked pleased at Harima’s happy face and went out to get the cake she made for Karasuma. But to her horror, the name on the cake was ‘Harima’! Tenma tried to fix the problem by cutting out a circle, hence taking out the ‘HARI’ out of the cake and presenting Karasuma with the rest. 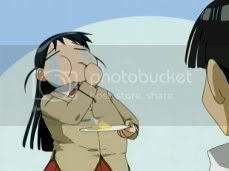 Tenma then proceed to eat the ‘HARI’ part of the cake and covered it up saying that she likes cakes lol. After the celebration, Tenma was sitting on the stairs, crying to herself and thought to herself that Karasuma must hate her now. 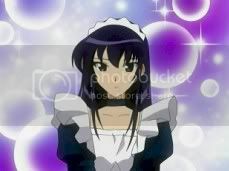 Karasuma appeared before her and noticed the photo Tenma was holding. 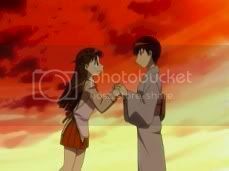 Tenma explained that Karasuma told her before that he couldn’t express himself well but in that photo, Tenma thought that Karasuma could so she wanted to show it to him. Karasuma smiled briefly, thanked Tenma and they walked home together. I love the part where Akira pretended to be the Mamasan and the setting to be like a kinda real brothel/hostess haha, and the cosplay lol. A really very entertaining episode. Oh the Tenma x Karasuma thingy seemed to be going pretty well. 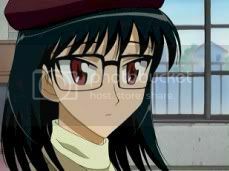 school rumble is so random especially Hatenkou robo~!, but thats what is great about it. 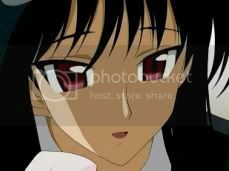 i blog about the latest episode releases of school rumble 2 and other anime, so check it out if you have time! thanks!